Bitcoin remains tightly wedged between support and resistance. Let's take a look at the chart and see what the cryptocurrency is doing. Interestingly Bitcoin is sitting on two lines of support at the moment. One is a short term support line that the bulls established at the beginning of August (Short red line), but of more significance is the orange line that price action is also sitting on. This line is a support line established that dates back as far as August 2015. We expect the bulls to put up quite a fight to maintain prices above $6000, and for Bitcoin as well as many alt-coins this is a critical price juncture to be fought over. 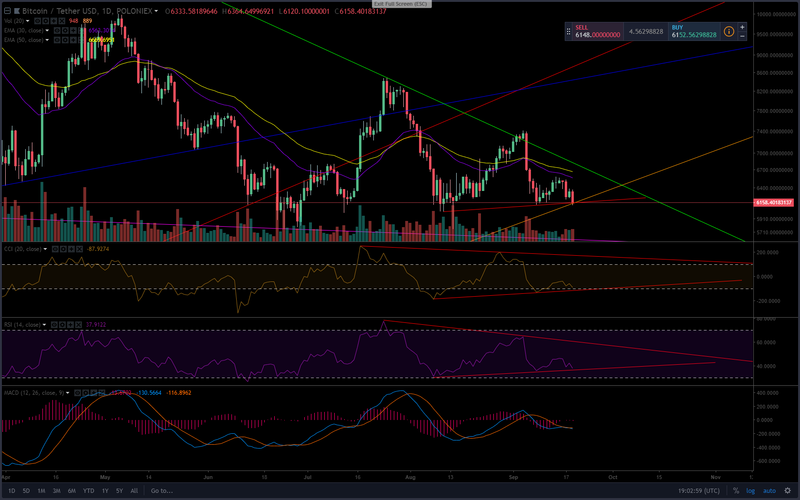 A failure of the bulls to hold the price above $6000 is likely to quickly lead prices in retreat to the longer term support line established back in February at $5500. The $5500 support level, by all technical aspects, is seen as weak now as the bears have attempted to breach this line on four separate occasions without success. If the bears are able to push the price down for a fifth test of this support level it is likely to crumble under the pressure pushing the price of Bitcoin down to the next major support of $5000. On the upside the bulls face a difficult challenge as the long term resistance line established from Bitcoin's rise to $20,000 is near at $6600. As such, it is a critical level for the bulls to break through, which, if successful could see Bitcoin run to $8000 levels before encounter resistance where the bulls will need to gather their strength before another push. Bitcoin is not presenting with a clear direction and as such the risk/reward for either a short or long position is too great. We will abstain from taking a trading position until we see a clear break either above the long-term resistance or below the support of $6000.